Do you have computer problems or something just not working right? Experiencing slow downs, blue screens, or other mysterious errors? If so, then you need a computer medic! 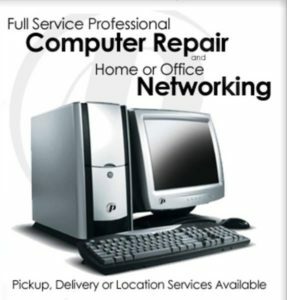 Contact me to arrange a complete computer physical. Computer Tune-up – Is your computer running a little slow? Getting weird error messages? Let me do the geek stuff and make it go away. This tune-up includes a hard drive check-up and optimization, emptying temporary files, removal of spyware/adware/malware/viruses, operating system updates, plus much more. Your computer will be as fast if not faster than when it was new! Data Recovery – Lost an important e-mail or document? Let me try to find it and help get it recovered back to you. Recovery success rate falls dramatically the longer you wait and the more you use your computer. Computer Setup – Got a new computer, new software, or need help setting up additional hardware? Let me get it connected and setup correct. See tuneup service above for this service plus more. HollisServices.com is not responsible for any lost data when doing repairs and recommends backing up and archiving any information that is important to you on a regular basis especially before any repair service is done. The following article was copied from PCWorld.com/PC World magazine. When I read this, it just reminded me of myself so much that I just had to have it on the site. Tech is so illogical and arbitrary, it needs folks like you and me to explain it to everybody else. Bad enough that I’m my own tech support person. Thanks to the muddled magic of digital technology, I also get to handle the support calls of friends, neighbors, and acquaintances. It’s not that I’m so smart. It’s that truly smart people have learned they can get more done by willfully ignoring the petty details of the technologies in their lives. When something goes wrong, they figure they can find some kindly geek to set things straight. And they’re right. Take a flight anywhere, and you’ll discover that few people know how to turn off their cell phones’ annoying startup and shutdown tunes. Backing up files? I’ve known people who thought that copying their data to a second drive was a great strategy–until the first drive crashed and they learned that the second “drive” was actually just another partition on the same dead hunk of hardware. With the Web’s increasing sophistication, things that used to be straightforward no longer are. Once upon a time, the mail you saved or the document you created resided on your hard drive. Now it may live on your provider’s server unless you take special action to make it local. That’s fine until you need the file 38,000 feet above Albuquerque, or the provider’s system crashes or its business goes bust. Plenty of users fail to grasp basics like these–until it’s too late. But people who don’t know that something is amiss with their tech may be happier for it. Consider the millions of TV watchers who apparently think they’re getting a great picture from any show that proclaims “broadcast in high-definition” even though they don’t own a high-def TV–or even though the set they do own isn’t connected to a high-def program source. Hey, think of the money they’re saving! Those of us who make our living by paying attention to such details tend to get exasperated when relations and friends who are no longer “novice users” fail to understand or care about what we consider simple. What we forget is that the “logical” tech world we take for granted is in fact highly arbitrary, whimsical, and proprietary. Why can’t you plug cell phone X into cell phone Y’s charger when they seem virtually identical? Why will phone X, but not phone Y, work in Europe? Why won’t a document created in Word 2007 open in Word 2003? If you follow the world of technology, you probably know the answers to these and other mysteries. Folks who don’t have a clue are probably getting real work done–until they blow up their cell phone or can’t open a Word document from their boss. And that’s when, inevitably, they’ll once again depend on the kindness of geeks.